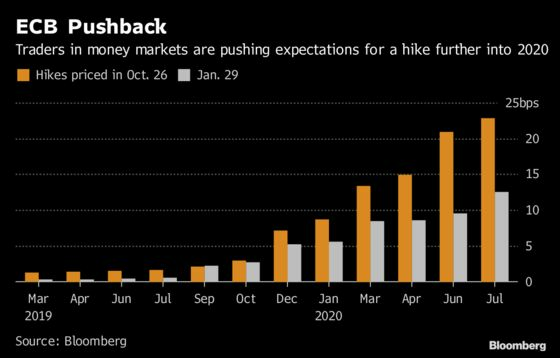 (Bloomberg) -- Despite the best efforts of central bankers, investors are betting the next phase of European monetary policy will look a lot like the last one. They’re sending yields lower across the region, letting bank stocks languish and spurring a rally in corporate debt -- all signs investors are positioning not for normalization but for another long run of easy money. 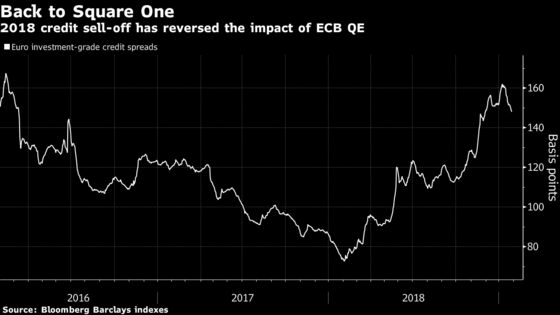 The verdict may be harsh, but markets reckon the ECB has no choice but to double-down on dovishness after economic data broke bad. 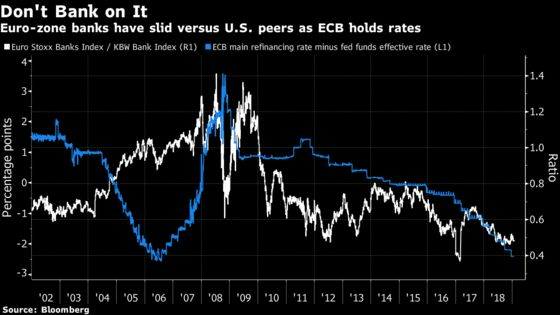 For starters, it looks likely they’ll have to refresh one of their lesser known stimulus tools by replacing long-term loans provided to European banks in a bid to spur real-world lending. Bonds may benefit from the ongoing accommodation but -- thanks to low rates and anemic economic data -- the outlook for equities is less rosy. German 10-year yields touched their lowest level in over two years this month and speculation is growing that they could once again drop below zero this year. 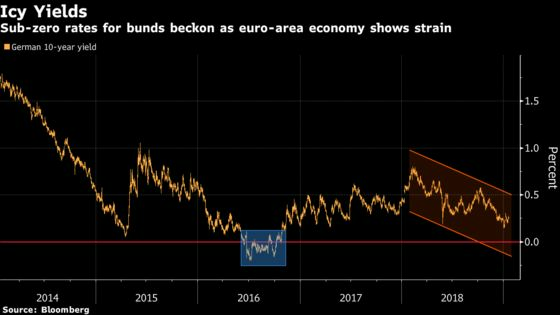 Italian bonds, which have been battered by budget battles over the past year, have also gained respite on the prospect of a more supportive ECB. In the corporate bond market, euro-denominated investment-grade debt is enjoying its best start to the year since 2015, according to Bloomberg Barclays indexes. The benchmark gauge has returned 0.6 percent this year, and spreads have tightened to their lowest level in almost two months. Still, they remain near their highest level since early 2016, when the ECB first unveiled corporate bond purchases, suggesting that the subsequent sugar rush has worn off. There’s also the argument that corporate bonds should be driven primarily by technical factors for now, such as earnings blackouts hindering supply and compressing spreads, as well as by more immediate risks like Brexit and the trade war. All the same, BlackRock Inc. cited easy-money policies alongside attractive valuations in touting BBB rated bonds in Europe. Growth “should stabilize at low levels in 2019, helped by extra-easy ECB policy, fresh fiscal stimulus and the lifting of one-offs such as regulation-related disruptions to the auto industry,” Richard Turnill, BlackRock’s global chief investment strategist, wrote in a note. The picture is murkier for investors in European stocks. Low rates are typically good for equities, but the region’s economic slowdown bodes ill for cyclical heavyweights, not to mention inflows from foreign investors. Lower rates also mean the banking sector, a big part of the Stoxx Europe 600 Index, may continue to be plagued by the profitability woes that have made it the worst-performing over the past five years. Even after joining the broader risk asset rebound in January, euro zone lenders are trading near the lowest versus U.S. peers since at least 2002. A lot may depend on how much bad news is priced in already. A delay in tightening will “allow loan growth hopefully to continue to grow in the euro zone -- good especially for banks,” he said. Add to that another round of targeted longer-term refinancing operations -- the cheap loans doled out to banks -- and the outlook would further brighten, he added.